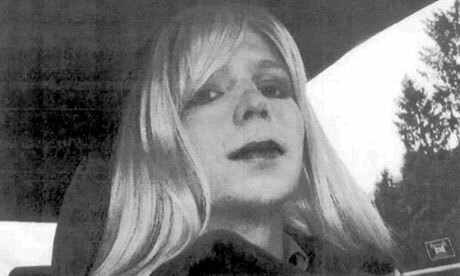 Picture of Chelsea Manning, formerly known as Bradley Manning. From The Guardian. The world is now paying more attention to Manning’s gender identity issues than the revelations she made that may cost her upwards of 35 years in prison. For those of you joining me for the first time, I wrote this funny little play a couple years back called HOW TO STOP THE EMPIRE WHILE KEEPING YOUR DAY JOB. It was fairly successful, and the YouTube presentation got a lot of views. People who remember the play (or who saw the video) say nice things to me when we meet on the street *. The YouTube Video that has been viewed some 11,000 times since the play’s premiere at the Occupy The Empty Space event in March of 2012 is not the complete play. It was what I could fit into 15 minutes (that was supposed to be ten minutes) allotted to me by the Occupy the Empty Space folks. The original is more like 35 minutes–Naturally, I dumped some big parts of it overboard. And (funny thing) the missing sections have a lot to do with the Manning case as well as the Jeremy Hammond and Barrett Brown and other cases. In recognition of what Chelsea Manning has done on our behalf, I need to forward some edits here. The movement has some martyrs–Scott Olson is one as well. But Manning and her fellow inmates Jeremy Hammond and Barrett Brown and John Kiriakou have done what the Transit authority keeps telling us to do–“if you see something, say something”–and paid the price for it with prison time. Now we’re at three. Use the money you saved in step two to help fight for the people exempt in step one. The Occupy People could use a spare Jackson or two. So could Habitat for Humanity and Amnesty and all the other white hats. And –if someone fought the good fight and they lost and are in jail, send ‘em a check. There are hundreds of political prisoners in this country who could use a shout-out. Chelsea Manning could use a letter and some good wishes and a check now that he’s been sentenced to longer prison time than anybody he ratted out through Wikileaks. There’s a guy named Jeremy Hammond, who let us know that the government had out-sourced the tasks the CIA isn’t allowed to do—he could use some mail. Friggin Barrett Brown is facing a hunnert years in jail for FORWARDING A LINK to somebody. These are people who are in the Empire’s prison for acts of truth and conscience, and while we all hope we’d do the right thing in the same place, these folks are actually in the slammer. So send them a thank you. Oh, and don’t confuse your ‘money for good’ with your IRA or 401K. This is money for the revolution. So here’s what I’m telling you–there are ways to support these folks who are in a very dark place at the moment. Support Links for the hacktivists are here: Manning’s support page is here, details to follow on his new address. But there’s much more important work that has to happen–and activists need to take it on. In my play, it sort of fits in as item five and a half, but it’s really the key. People have to occupy juries. Okay, step seven: Those of us who have an address that includes a mailbox with our name on it sometimes get depressed when we get mail ‘inviting’ us to be on jury duty. Wrong approach. Occupy the Juries. The dirty little secret is that the empire can’t keep all this going without the illusion of justice and juries of peers. That’s a huge Achilles heel. And they know it, which is why judges don’t tell you your rights as a JUROR. One of the founding fathers, the game changers, for the colonies was that William Penn guy, who persuaded people that they had a right to vote their consciences when it came to the state. And it means IT DOESN’T MATTER how good the state’s case is—if you’re a juror, you vote your conscience. You know that even if everybody else trapped in the Jury Pool waiting room doesn’t. So don’t let the court know—get on the jury and blow things up. And let me explain why this is important. When I got to Europe a few years after I got out of jail, I found out that courts don’t prosecute people like me for felonies there. You know why? Because people who sit on juries VOTE TO ACQUIT. If I’d been caught painting over a military sign in Holland or England, I wouldn’t have been charged with a felony because they don’t want to seat a jury. And they don’t want to seat a jury because as long as I didn’t hurt anybody, they’ll vote ‘not guilty’. What that means is if we in this country want to stop the empire, we have to occupy juries and make sure that people who undertake nonviolent acts of conscience don’t face hostile juries. So don’t fake a reason not to serve on a jury—figure out how to change the game the state is playing. By the Way, all you legalize pot folks—stop wasting your time on petitions and marches and start working to make it impossible to prosecute for marijuana possession. Once that happens, every defendant with a few ounces on a felony possession charge can demand a jury trial and the whole system breaks. Trust me. I don’t know how much this would help Chelsea Manning. But if people like Jeremy knew they could get a fair trial and demanded a jury, they wouldn’t plead out. See my point? We are living in bad times. Pentagon Papers veteran Dan Ellsberg just stated that Manning’s conviction is proof we’re living in a state falling into fascism. Understand that this isn’t about the government that’s changed. Richard Nixon wasn’t a ‘nicer guy’ than Obama. The difference is simple. If in 1971, Nixon had gotten Ellsberg thrown into solitary confinement/sensory deprivation (deprived of even clothing) for the better part of three years, and had intimated its desire to do the same to the publishers/producers at the news organizations that published the Pentagon Papers, every media outlet of note would have thundered about this violation of the First Amendment. And as for the excuse that Manning was under military governance, that doesn’t hold water–we’re doing pretty much the same sort of imprisonment to civilian hackers like Jeremy Hammond and journalist Barrett Brown. We’re on the road to fascism because the MSM is permanently in bed with whoever’s in the White House, and wouldn’t dare rock the boat. Those of us with a conscience need to call out the real criminals and support the folks caught up in the government dragnets. PS: I will tour my play to your place of gathering–I’m cool with church basements, pot luck suppers, large theaters or public space in front of courthouses (been there done that). I need travel money and Pizza and good beer. For an over-nighter, a place to stay. UPDATE: It looks like I will be performing the full play in about two weeks as part of the second anniversary of the OCCUPY beginning. Watch this space for times and dates! * NOTE: For the record, this is a FICTIONAL PLAY based on interviews I’ve done with activists, including activists who’ve done serious jail time. I have NOT done serious jail time. I have NEVER done prison time. I’m sorry to disappoint the people who think I have.